Luke Grant played on both sides for Heritage, contributing exciting plays throughout all of last fall. The athletic receiver has very reliable hands and is a crisp route runner that leaves the DB completely out of the play. Grant had 14 scores last year, a task he achieved in 7 different ways on both sides of the ball. He showcases a smooth running stride with the ability to quickly accelerate, making defenders take terrible angles. Grant is an extremely versatile player, but his offensive instincts, and ability to make the defender miss, makes him an ideal slot receiver at the next level. 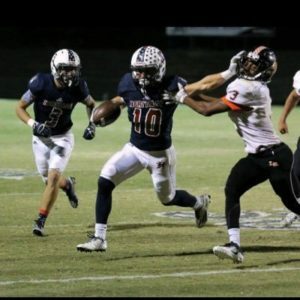 Even against undefeated Ridgeland he was nearly impossible to stop and scored two TDs. Grant easily has some of the best hands in Georgia and degree of difficulty on some are very high, but even more astonishing is him keeping his feet and running the rest of the way for a score.